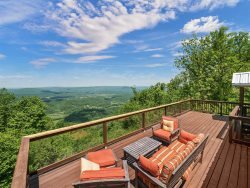 Welcome to Chattanooga Vacation Rentals’ travel blog. We are more than just a team dedicated to finding you your best vacation cabin or home. We are locals who LOVE Chattanooga. Our team members are whitewater and kayaking enthusiasts, hang glider pilots, swimming hole junkies, hikers, bird watchers, and climbers. And we are total foodies, music lovers and art lovers! We are no strangers to navigating the city with children or to scouting out the restaurant patios that are as welcoming to our dogs as they are to us. We know the best walking routes to take you from the Hunter’s Museum of American Art, over the walking bridge, and on to Frazier Avenue and Coolidge Park to check out the great local shops and ride the hand-carved carousel. Where are the romantic spots? CHECK. Where is the free music? We got you there too. Girls’ weekend? Honeymoon? Boys’ trip? Family reunion? Outdoor adventure enthusiasts? You will find answers to questions that you didn’t even know that you had. The Chattanooga metropolitan area is not only the city. Technically, it is three counties in southeast Tennessee and three counties in northwest Georgia. That means rivers, lakes, creeks, mountain tops, boulder fields, cliffs, and waterfalls are all part of Chattanooga. We know the city and the wilds like the back of our hands, and we will share our local insights with you to make your trip fantastic. Just as our town is more than just its city blocks, our blog articles will cover more than just the city itself. Check back often to learn all things Chattanooga and Chattanooga Vacation Rentals.